Every 3 years the City of Cape Town does a revaluation of all properties in accordance with market values to ensure that the property rates charges are assigned fairly and correctly. How is your property valuation calculated? Property valuations should reflect the market value of a property. The City uses a property’s value to calculate the monthly rates property owners should pay for their property. The municipal valuer, as in the City’s valuer, is responsible for producing the General Valuation Roll (GVR) and is assisted by professional valuers, statistical analysts, data collectors, and support staff. 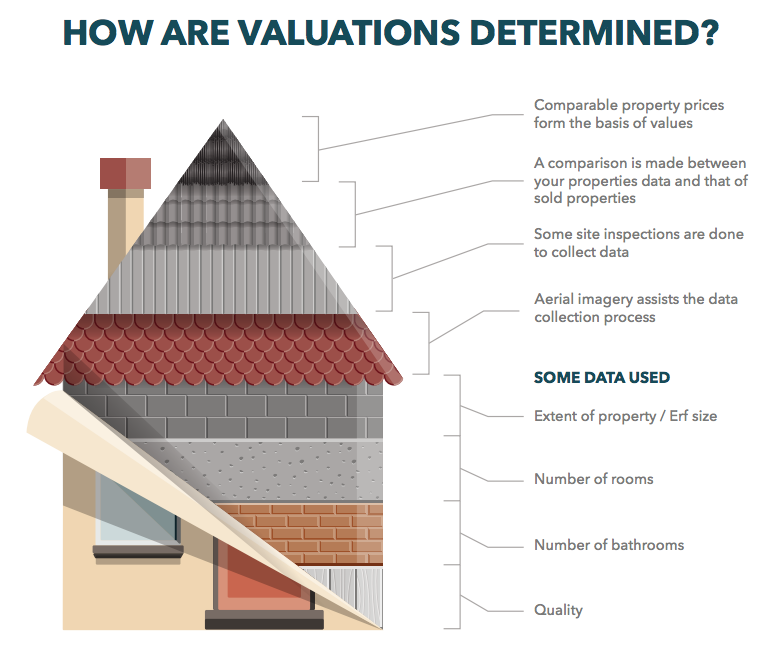 The valuations staff collect and review sales that take place around the date of valuation – the latest valuation forms part of the General Valuation (GV2015) Roll with property values as at 1 August in 2015. The sales data is used in the Computer-assisted Mass Appraisal (CAMA). CAMA is used by valuers to value properties in Cape Town. To ensure fairness, the GV Roll is audited by an independent body – the GV2015 was audited by International Property Tax Institute. In most cases, properties are only physically inspected when the property’s information on the valuations database is doubtful or where changes have taken place. The City Valuation Office is currently preparing the GV2018 valuation roll. The GV2018 will be published in February 2019 for public inspection and objection. Look out for your GV2018 valuation notice in February 2019. More information will follow in January 2019 about the GV2018 and the public inspection and objection period. Implementation of the new Municipal Valuation and your new rates account will be 1st July 2019. Information sourced for Cape Town City Council and professional valuers.